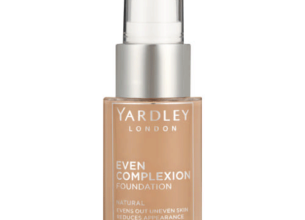 Yardley Even Complexion foundation combines skincare benefits into a complexion perfecting foundation. * Leaves skin looking radiant day after day. * Available in 8 shades: Almond, Caramel, Caramel Fudge, Hazel, Mahogany, Medium Beige, Natural and Sand Beige. Yardley never disappoints – I simply love this foundation. It feels great, smells fantastic, and doesn’t make me look like a porcelain doll, like most other foundations do. It has the right amount of coverage and feels lightweight on my skin. The formulation is not too runny or too thick. It absorbs into the skin quite fast. It’s not greasy, nor drying. It’s highly moisturising and gave my skin the perfect glow. My favourite feature is the fact that this foundation has an SPF, so I don’t need to worry about applying a sunscreen separate to this product. Whether it works to even out uneven skin and reduce the appearance of dark spots is still in question. I need to use it a bit longer to hopefully see results. Otherwise, I’m very happy with this product and would recommend it to anyone looking for a light coverage.